Thanks for coming to our site and heading on over to this humble ‘About Us’ page. My name is Eden Brownlee and I’m the CEO and Founder of Ozkilts.com. Deliver quality, functional Utility Kilts to the world! With the influx of overseas manufacture the Utility Kilt industry has been flooded with terrible quality products that you wouldn’t even want to wear at a costume party, to make things worse, a bunch of apparently ‘local manufacturers’ started popping up all over, who actually just ship you the exact same poor quality items from countries like India, China and Pakistan. Now, using overseas manufacture wouldn’t be a problem if the quality control was good, the patterns used didn’t cut corners on important features (like the front Z apron is often removed to cut down on the material used), and these people were wearing their products so they knew the problems faced. To add to these frustrations, often the $conversion$ rates for different currency purchases are less than favourable, and shipping costs your first born (but they don’t tell you that until you go to checkout… how frustrating), and after paying an arm and a leg for your Kilt (or getting it ‘cheap’ and getting what you pay for), then you’re then faced with a huge wait time for shipping! And so, OzKilts was forged out of these frustrations. I’ve slaved over many a coffee or other delicious beverage working with fashion designers, creating branding, manufacturer relationships, and everything else in between to create a quality range of products and a smooth ordering process, making buying a your next quality utility kilt a fast and fun adventure! It’s my own (and my teams) goal to bring Quality handmade Utility Kilts throughout the world. We offer quality updates on existing patterns are eager to release new styles and FREE PRIORITY SHIPPING ON ALL ORDERS (because seriously, who gets excited over working out shipping costs?!?!?). The women seriously love it, and you will too! See you all on the dance-floors, hiking trails, workplaces, and everywhere in between! Here’s a picture of me holding a chainsaw while cutting some 3000 year old ancient petrified wood… and of course wearing a Kilt and my ‘Wicked Witch’ leg protectors. 🙂 Enjoy! Need help? Click here to ask us a question! Sign Up for Discounts, Specials and amazing offers! Please Note: Our Premium Delivery Providers cannot deliver to PO-Boxes. Please use a residence or business address only. Sizing yourself for a Kilt shouldn’t be a chore, and will usually only take a minute. However, it is important its done correctly to ensure you get a perfect fit the first time. Before we get into the ‘HOW’…. WARNING: NEVER USE YOUR PANTS SIZE TO ORDER A KILT! Sizing yourself for a kilt is a simple and quick process. Firstly, you need to understand a Kilt can be worn in two main ways, so you will need to measure for one of these. On the waist/hip (like a pair of jeans or shorts, ‘comfort fit’), or at the belly (‘traditional fit’). Most modern Utility Kilt wearers today seem to prefer wearing them at the hip, as this is what they are most used to when wearing other clothing, but either way is fine. We do recommend if you’re wearing our Deluxe Kilts you give the hip/waist position a try, as we feel this offers the greatest comfort, although, its really up to personal preference. For best results, a cloth measuring tape is best used (pictured above), if you don’t have one of these, a peice of string, a belt, or something similar can be used very carefully, then measure the length that it wraps around you using a ruler or normal tape measure. Again, when when using a cloth measuring tape, be VERY CAREFUL you measure accurately, we suggest you do a couple runs (even when using a cloth tape) in order to ensure you have got the right measurements. When selecting your size, simply select the size range you are inside. If you are inbetween a size, then select the next size up. For example, if I measure myself at 85cms (inbetween sizes for a small and a medium), then I would order a Medium. Simply follow our sizing chart below! IS YOUR PHOENIX KILT REALLY FIREPROOF? We do our best to ensure our Phoenix Kilts is as Fire Resistant as possible, with extra features for fire safety. To do this, we use a heavy duty 100% Cotton as Recommended by Fire Performers, this should give you a nice +5 boost to fire resistance. Now, of course we need to disclaim that this does NOT make you 100% fireproof, if you run into a burning building wearing just your kilt, you will get burned!!! We hold no responsibility for accidents or injury caused by exposing our Kilts to flame or extreme temperatures. As always, safety first, when in doubt, leave it to the professionals!! These kilts also come with our Velcro Fastening System, and our Flex Pleat Design, for easy removal or change during performances or daily wear, added comfort, and detachable pockets so you can keep them out of the way when they are not needed. WHAT’S THIS I HEAR ABOUT FREE SHIPPING??? All our orders throughout the world are eligible for free shipping! So YES, just place your order and we will create your beautiful new kilt, and ship it to you using International Priority Shipping. Once your item has been created by our skilled Stitch Masters, we will email you letting you know, you can then log into your account on our website and use our special parcel tracking system! If you ever have an issue with your parcel just get in touch with me at eden@ozkilts.com and we will get you sorted! Remember, our average delivery time is now just 3-7 business days from the date you place your order. Please note, that residences defined as being located in remote areas according to DHL, DPEX or TNT, or other shipping providers, may incur a surcharge for delivery. If you live in a remote area, we attempt delivery and it is rejected by our carrier as being a ‘remote area’, you may be required to pay a remote surcharge in order to receive delivery of your kilt (We simply pass the these fees on from the delivery providers, we have seen these fees be up to 30-40 USD in some really remote area situations). We will not offer refunds on orders already purchased because of delivery issues if you live in remote areas, did not collect the package, or didn’t enter correct delivery details. If you are concerned about this please contact us prior to placing an order. 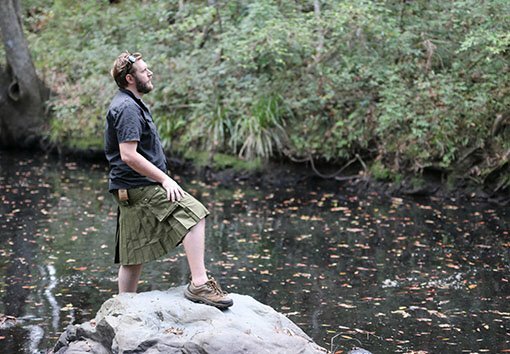 Attention Customers: As part of our mission to create the worlds most Comfortable & Durable Kilts, we are hoping for all new & outstanding orders to be dispatched by April and will contain our new design improvements + higher quality fabrics, future orders after this will take approx 3-5 days delivery.